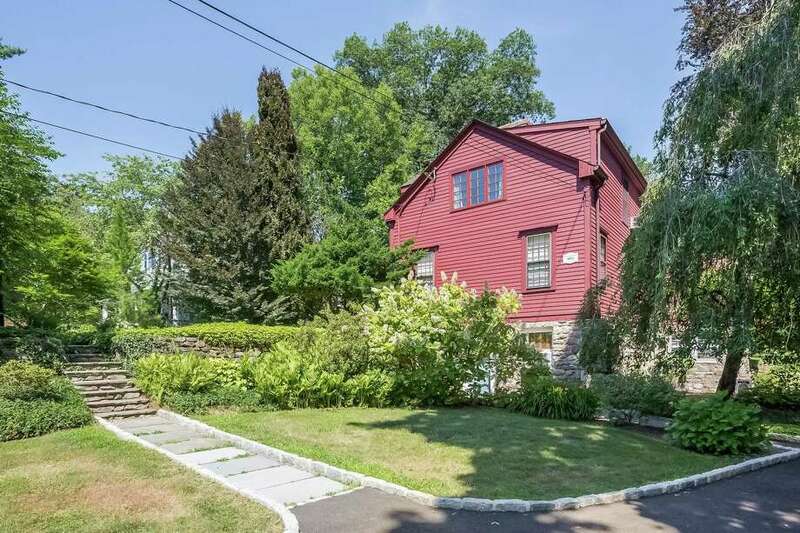 The antique red colonial house at 38 Kings Highway North was Westport’s first school house. WESTPORT — Prolific artist and Russian native Ossip L. Linde (1871-1940) moved to Westport in 1911 and chose a particular property in the Old Hill section for his art studio. The red colonial at 38 Kings Highway North was an antique when he purchased it. The house had existed for almost a century at that point, and what is now the spacious formal living room served as the town’s first school house. “It is the earliest standing school house in Westport. It was a district school called Shercrow School built in 1812 and moved to its current location in the 1930s,” said Robert Weingarten, house historian for the Westport Historical Society. “The (exterior) walls are clad in clapboard and rest on a rubble stone foundation that is raised a full story on the south elevation … A bay window addition is attached to the center of the facade,” according to a Historic Resources Inventory sheet from the Connecticut Commission on Culture and Tourism. The document, provided by Weingarten, indicates the original part of the house may have been on Old Hill Road and after it was moved to Kings Highway North it was expanded by subsequent owners. The attractive house and its 1.67-acre level and sloping property, which is beautifully landscaped, looks like it belongs in a Linde painting. He was known for his Connecticut landscapes and other subject matter. His painting were exhibited at the Art Institute of Chicago and the National Academy of Design. Today his etchings and paintings are included in many collections including at the Carnegie Institute, according to www.artoftheprint.com. The 3,100-square-foot house has received many improvements through the years, including more recently, yet it has retained its historic charm and some of its historic features. The original fireplace and hearth from its days as a school house is in the spacious formal living room, one of the owners’ favorite spaces. “When I walked in the front door and looked in the living room I stood in the threshold and thought it seemed so elegant in a historic Connecticut sense,” said Jane Ross. She and her husband Edward Brennan purchased the house in 1991. The house lured them from New York City to Westport to raise their family. “I fell in love with the house. I wandered through the rooms and marveled that we were lucky enough to be living here. It’s so beautiful, it’s so spacious. It has wonderful light,” Ross said, adding that this house offers a great space for a family, for entertaining and holidays. It also offers a great amount of privacy as well as convenience. The location of this secluded retreat puts it within walking distance to downtown Westport, Earthplace - the local nature center, shops and restaurants along the Post Road (route 1), and Kings Highway Elementary School. It is also just a short drive to Compo Beach and Sherwood Island State Park, and only minutes from the Saugatuck Metro North train station via minibus. The orientation of the house on the property has the “front” door facing the north side. There are steps leading from the Belgium block-lined driveway up to that entrance. There is another entrance from the driveway into the full finished lower level, which has a legal rental apartment with a separate entrance. The apartment has a bedroom, dining and living area, kitchen, and bath. It has been used as an office for a home-based business. This lower level also has an exercise room, a laundry room with a utility sink, and a workshop. On the second floor there are four bedrooms. The master suite has a floor-to-ceiling red brick fireplace. Outside, rugged rock outcroppings create tiered gardens on the grounds, which were enhanced by Ross’s green thumb. She planted many of the perennial flowers and shrubbery. “Every room looks out at something beautiful and interesting,” she said. Rumor has it this was not just the site of Westport’s first school house but also its first in-ground swimming pool. Ross said she was told by Linde’s daughter Margaret that she learned to swim in that pool. There is a part of the yard where the remnants of a pool are visible. This property has room for a pool and a tennis court. The acreage is also sufficient to add a garage and the owners have a drawing to show an optimal location for it. For more information or to make an appointment to see the house contact Marybeth Sullivan of William Raveis Real Estate at 203-984-8025 or Marybeth.sullivan@raveis.com.